Today I'm featuring my current read, Origin by Dan Brown. The excerpts shared are from a library copy. Page 56: "''What I showed him threatens his world, and I want to know if you think I'm in any physical danger from him.'" My thoughts: This is the latest book in the Robert Langdon series, which began with The DaVinci Code. I'm not very far into the story, but the plot seems to follow Brown's formula of fast-paced adventure centered around symbols, age-old institutions, and intrigue. It promises to be the perfect weekend escapist read. 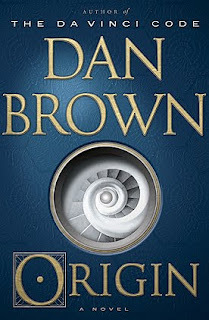 From Goodreads: Robert Langdon, Harvard professor of symbology and religious iconology, arrives at the ultramodern Guggenheim Museum in Bilbao to attend a major announcement—the unveiling of a discovery that “will change the face of science forever.” The evening’s host is Edmond Kirsch, a forty-year-old billionaire and futurist whose dazzling high-tech inventions and audacious predictions have made him a renowned global figure. Kirsch, who was one of Langdon’s first students at Harvard two decades earlier, is about to reveal an astonishing breakthrough . . . one that will answer two of the fundamental questions of human existence.